Brothers Frederick S. Cook[e] (the younger boy at left) and Theodore Cook at the Cordova Ranch in Castaic (now under the manmade Castaic Lake) in about 1886. Detail from AP2205. 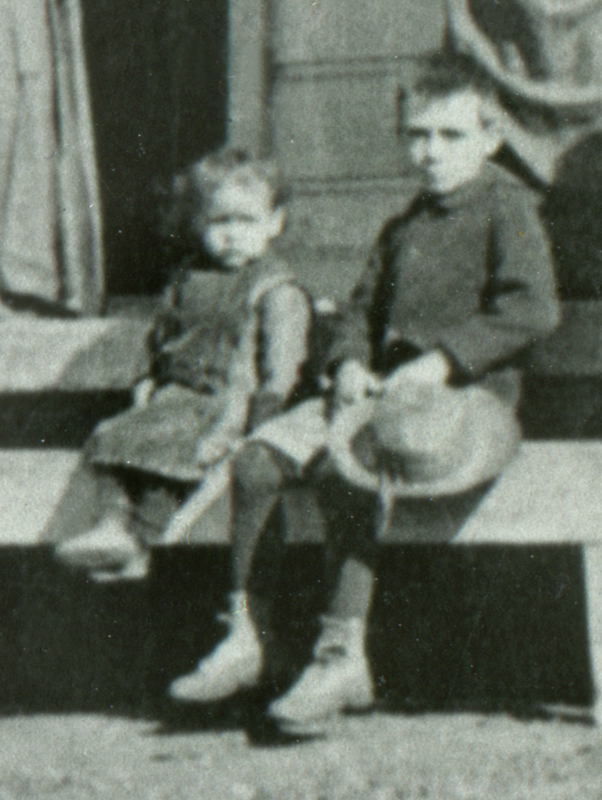 Fred and Theodore are sons of Dolores Cook and Francis Olme Cook. Fred was born March 28, 1881, in Los Angeles. He would marry Chief Frances Garcia, a Native American whose lineage traces to Chaguayabit (Castaic Junction) and other nearby villages prior to European contact in 1769. Fred and Frances added the "e" to the end of Cook. Fred died in 1958 and rests with Frances in the Ruiz-Perea Cemetery in San Franciscquito Canyon. AP2205d: 19200 dpi jpeg from copy print.